But then I realized it was getting out of hand. I thought I was just an introvert, mistaken for a shy person. Introverts often prefer to be alone; shy people are scared of social interactions with strangers. It’s a big difference. And then I ventured forth into the world. Not knowing what the future holds. But not fearing, either. I sallied through a doorway, imagining myself in a brown cloak, and approached the front counter of a cafe. I am a Jedi; this is Mos Eisley. The threshold of adventure. And then the cute guy at the counter says hello and smiles a big smile and asks me how I’ve been. What does our fearless heroine do? How does she serve the higher principles of Truth and Justice for which she fights? She swerves abruptly away from the counter and makes a beeline for the back bathrooms. Yep. I rushed past. Skittered. Speed-walked. And right then, I knew it was time to re-evaluate. I realized, at that moment locked behind the restroom door, that I was afraid of many more things than I had ever admitted to myself. And that the more I focused on how afraid I was, the worse it got. I emerged from the bathroom and thought hard about being a damn fool. But the harder I thought about being a damn fool, the more I acted like one. As I rushed out to catch my bus, I realized something key: I was sorry. Yes, because I’d been an idiot–but so much more because I’d been unkind to someone who had waited on me and rang up my orders and been pleasant about it for months. Being scared and uncomfortable–regardless of all the reasons behind it–was no excuse for how I’d treated another human being. I went home and read up on shyness, determined to admit my fears so that I would never again do that to a decent person. And Alex Lickerman sharpened the picture for me–what I’d only begun to glimpse, vaguely, on the bus ride home: for most people, the way out of shyness isn’t therapy or anxiety medications. Focusing one’s thoughts on the other person, rather than on my own comfort. 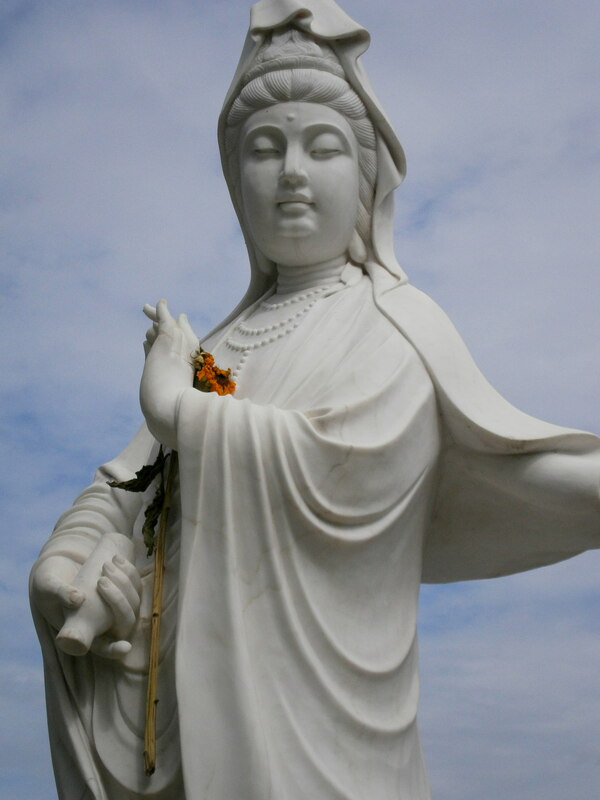 And I thought of the bodhisattva, Kuan Yin, pouring forth her vial of compassion over the world. Be more like that, and it will be easier to be brave. Think more of others, and there is less to be scared of. In part, because I’m more aware of what’s really happening around me–but also because their comfort becomes my own. Now to the real world again–to see if I can put it into practice.